I have been out of step with the market for several years. The valuations and underlying fundamentals are pretty much outrageous. Perhaps the proverbial bell rang this week. Market internals have been horrible for quite some time, that’s why most market participates have been left behind despite the rising stock market of the last few years. The strength in the large momentum names is gone, there is no where left to hide. The narrow market has reached exhaustion. Already 74% of NYSE stocks are below their 200 DMA, a downtrend started early 2013. Yesterday (8-21-2015) the NYSE had zero new highs and 627 new lows. The VIX has had the largest one week spike in history, from 12.83 to fear 28.03 in 5 days. 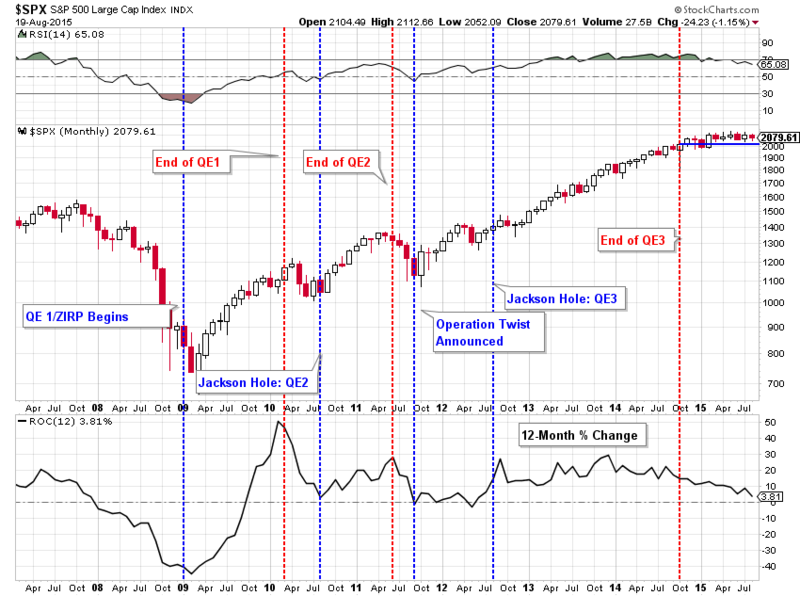 Yet YTD the S&P 500 index is down just 4.3% and the Nasdaq Comp is down only 0.63%. The Biotech’s are still 10% higher in 2015 and 28.3% year over year; manias end badly for investors. Initial public offerings as a froth indicator peaked last fall. The Nasdaq 2000 and 2015 are a double top if I’ve ever seen one; perhaps she’ll punch through permanently in a decade. Don Coxe: Bond Bull Coming to an End and Bonds Now a Center of Risk is an excellent listen for those who haven’t run across Coxe’s commentary in a while. The junk bond market has cracked with credit spreads at multi-year highs, something which began, ironically, with the energy issues. When a stock market break occurs, the record margin debt will be a downside catalyst. The familiar margin debt charts show margin debt 40% above previous peaks. Further, margin debt as a percent of market value is high, with free cash being particularly frightening. Just two days ago the DJIA and Nasdaq entered corrections (first since 2011! ), and these newfound speculators will become forced sellers. Cash ought be the largest position of any investor. Period. Gold will be the asset of choice for the next recession (which is not imminent). Central bank bond buying and ginormous fiscal stimulus (budget deficits) will drive the mania. In the meantime, gold bulls will have to be content with a currency war. Gold ought to be the second largest position of any investor. Another bell was rung: The 491 million ounces traded in two weeks is highest volume in history. That was fast! Precious metals have already reached short term rebound targets. Adam Hamiliton provides a starting point for speculators in junior gold equities. Student loans will be the next big political fight. Silver is extremely interesting long term as a play on the remarkable booming solar build out worldwide. Maybe the next silver bull market has already started. Twice in this young century investors have made (and lost) fortunes in the energy complex. Consider conservative Baytex Energy (BTE). This heavy oil producer with low production costs has collapsed again. Two days ago the income security cut the dividend to zero. In a stable $100 oil price environment Baytex provided shareholders with an annual C$2.88 dividend. Yes, Virginia, that implies a return to robust oil prices means patient buyers of the stock could realistically see a 50% dividend yield on today’s shares. It’s just not a bet I can recommend at this time. Shares may be more likely to get cut in half before any sustained move higher and are a function of an unlikely oil price rebound. 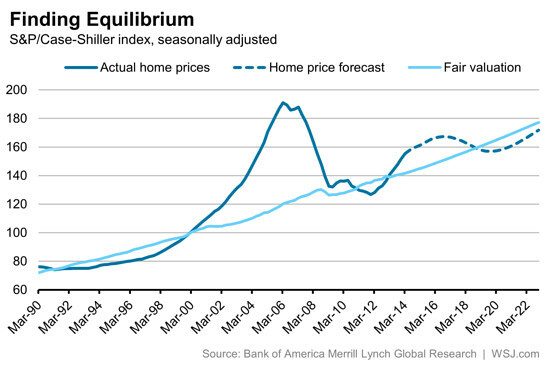 House prices should remain stable (and homebuilding will be a tailwind for economic growth in the years ahead). Higher interest rates are a financial pricing negative. However, fundamental household formation supply-demand is strong. The world outside of the United States is experiencing anemic economic growth. But stateside conditions are better and job growth is not a bad as thought. The difficult environment for asset prices can exist with decent economic growth. The dynamic seems strange at first, but is the norm in a rising interest rate environment.